When callers are put on hold, music is played over the phone while they are waiting. You can upload your own music file to play. 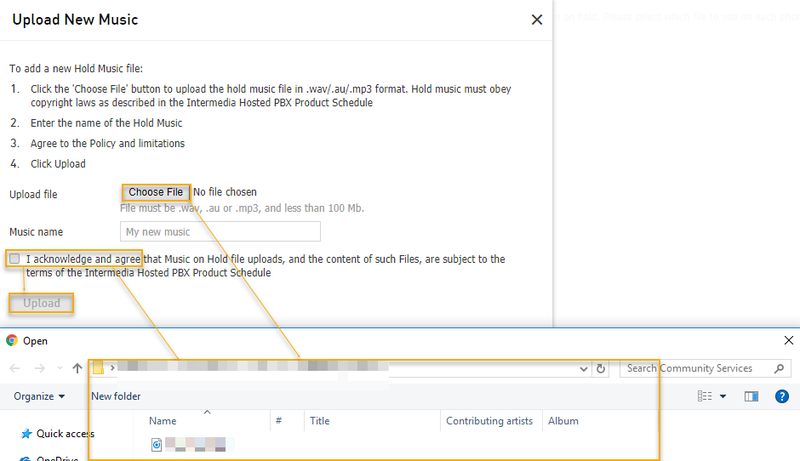 If you do not upload your own files, callers will hear the music that is set by default. When choosing files to upload, be aware that you are responsible for following copyright regulations and the Acceptable Use Policy. 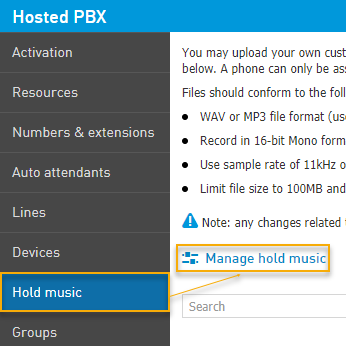 Setting-up hold music for the call queues. In the Upload New Music box, click Choose File to find the .au, .mp3, or .wav sound file (.ogg type files do not work on this platform. You can also type the location of the file. Once you have chosen the file to upload, you can name it. Note: the maximum file size is 100mb.The maximum hold music time, before looping occurs, is 4 minutes. Read and accept the agreement under the box, and click Upload. The file is now added to the list of music files. 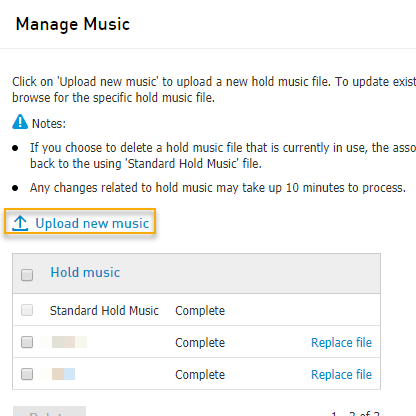 To remove a file from the Manage Music list, click the radio button, to the left of the file, and then click the Delete option at the bottom of the screen. 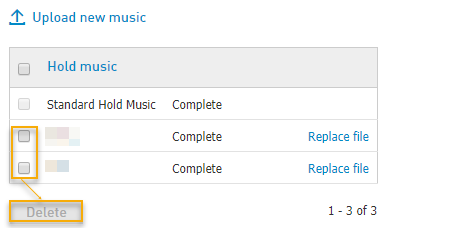 Now that the Hold Music has been uploaded to your list, it’s time to select it and assign it to a number. Click the radio button next to the number of choices, and then click on the drop-down in the right side column. Choose your file from the dropdown list. 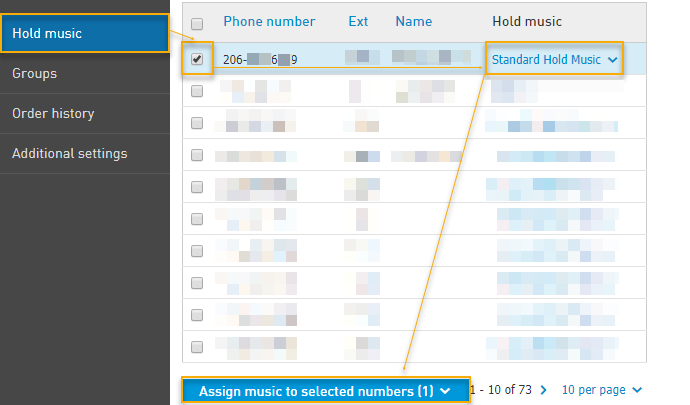 Click Assign music to selected numbers at the bottom. This will now assign the music to the selected numbers. Note: that the change may take up to 10 minutes to process. 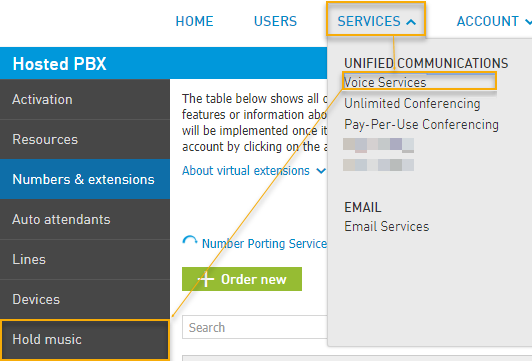 Navigate to Services > Voice Services > Auto Attendant. Click on the Auto Attendant whose Hunt Group you wish to modify. A new window will pop up, exclusively for managing the auto attendant. Click on Hunting/Queuing on the left side of the screen. 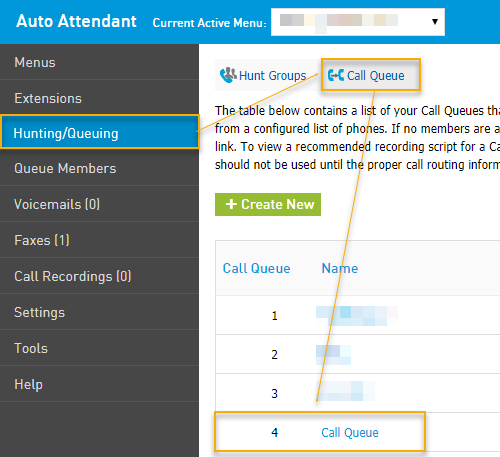 Then click on Call Queue at the top of the screen. Choose the call queue you wish to add music to. Navigate down to the Recordings section and click on the dropdown to the far right of Queue Hold Music Recording. Choose Custom Recording from this drop-down. This will populate a Choose File macro button. Click Choose File and navigate to the .au, .mp3, or .wav sound file. You can also type the location of the file. Once you have chosen the file to upload, you can name it. Note: the maximum file size is 100mb; as well as the maximum hold music time, before looping occurs, is 4 minutes. Note: the change may take up to 10 minutes to process. Important: there is no way to adjust the volume of the hold music. To increase/decrease the volume you can use free app such as Audacity before uploading the file.